Take control of which products are shown to your customers, how they are viewed and when they will see them. Custom Filters – set by shop default or by product category. The complete freedom and flexibility for your shop. 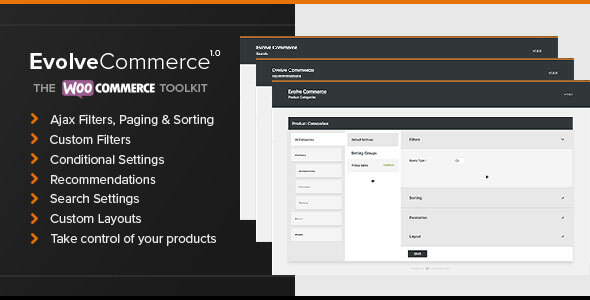 Evolve Commerce gives you the tools to get the results with out of the box functionality. Instead of just giving you the solution, EvolveCommerce gives you the tools and complete control over how these results are delivered to your customers. Develop a story and cycle of consumer patterns and Evolve Commerce will help guide customers to action. Show Flash Sale items in product categories on certain days and at certain times and show particular products on particular days and times. Show sale items or recently viewed items top of categories on last day of the month / payday. Show certain products at weekday lunchtimes. We believe that a customer’s first interaction with your shop is one of the most important opportunities for you and for them. The Industry has proven that the ability to customise how your products are shown, when they are shown and targeting why customers view your products helps to create a story, trigger emotions and lead your customers to action.